Improving monitoring tools, techniques and survey design is an integral component of ensuring the safe and secure geological storage of carbon on a commercial scale. In Australia, regulations are being developed for monitoring and verification activities at commercial-scale CO2 storage sites. Monitoring can involve groundwater or atmospheric monitoring as well as soil testing. Research is being conducted to ensure the most efficient and accurate monitoring practices can be adopted in the industry. Geoscience Australia and the CO2CRC operate a greenhouse gas controlled release facility at the CSIRO Plant Industry Ginninderra Experiment Station in Canberra. The facility enables researchers to study emissions of CO2 and other greenhouse gases from the soil into the atmosphere under controlled conditions. It also provides an opportunity to test and develop monitoring equipment and techniques. In mid-2012 the first subsurface CO2 experiment was conducted at the facility. The experiment was conducted to evaluate different monitoring technologies and track how CO2 moves through the soil and into the air. The controlled environment at the facility means that researchers can test how CO2 behaves under different climatic conditions, in various soils and with a range of monitoring tools. 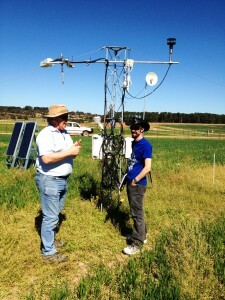 This is particularly useful for testing equipment and gathering data tailored to the unique Australian environment. 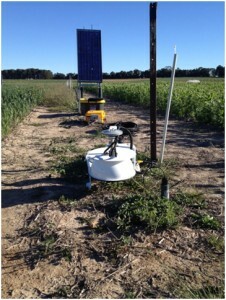 NGL researchers were invited to participate in the third release experiment in late 2013 and the new atmospheric and soil gas monitoring equipment was used to measure direct soil flux, atmospheric flux and atmospheric concentration of CO2. The aim of the experiment was to compare and evaluate current monitoring technologies in order to increase monitoring capacity and capability in Australia. Research conducted at the facility has been highly interdisciplinary with ten national and international organisations taking part to date. Organisations include CO2CRC, Geoscience Australia, CSIRO, the University of Adelaide, the University of Western Australia, the Australian National University, the University of Wollongong, the National Geosquestration Laboratory, Airborne Research Australia, the China Geological Survey and Montana State University. Research into the effective environmental monitoring of carbon storage sites is vital for demonstrating safe storage of carbon on a large-scale. It also helps in determining suitable locations and conditions for storage sites.